Revolutions seem to take forever, and then happen overnight. The electric grid revolution is still in the forever stage. But California and New York covered some big ground over the last couple of weeks. The two states are moving toward a decentralized, more democratic, less monopolized electric grid, one where energy markets are open to the rest of us. Several other states are positioning to follow. Here’s how the two lead state proceeded — each in very different ways — and why their actions are important if you’re in the power industry, or not. Your car, your house, your building or business could become participants in this new electric market. So everyone might want to pay attention. In theory, energy democracy sounds great. In practice, it’s complicated. Businesses and homeowners have neither the time nor the expertise to sell the extra output from their microgrid, solar panel, battery or electric car to wholesale electric markets — although they would like the benefits. So kudos to California for continuing to pave the way for a new kind of business that will do it for them — the aggregator or bundler. The California Independent System Operator (CAISO) approved rules that make it easier for aggregators to bring together a group of consumers or businesses and then sell their combined energy output into the wholesale electricity market. 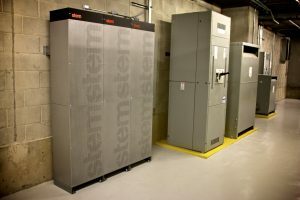 This means that homes, buildings, parking lots, stores, factories, schools and others with distributed energy systems can group together, bundle the energy they produce (or save) to meet the half-megawatt minimum to participate in the CAISO market. Both utilities and private companies can act as bundlers. But the private companies — the aggregators — are the more interesting part of the new energy democracy, since they are entrepreneurs eager to push the electric grid revolution forward. The size limit had been preventing the bundled sales from happening, along with metering and telemetry requirements that CAISO also changed. Now the aggregators will be allowed to manage the metering and telemetry on behalf of a bundled group, and act as a single point of contact with the grid operator. This relieves building owners from the burden of managing energy scheduling and communications on their own. The CAISO decision isn’t perfect. It has limits that the aggregators would like to see go away. For example, it places restrictions on bundles with multiple kinds of generation that cross more than one electric grid pricing node. But the restriction is necessary, CAISO said, until it can better understand how the resources affect congestion management on the grid. “There is still work to be done, but CAISO’s decision is an important first step toward expanding access for distributed solar and storage in wholesale markets, and ultimately creating a market for distributed energy resources providing a full suite of wholesale services,” said Genevieve Dufau, deputy director, policy at SolarCity. California and New York are in a kind of horse race toward a decentralized grid. Jobs and economic activity hangs in the balance. But it’s a race that’s hard to handicap, since they are running on different tracks. Both are good, just different. New York’s isn’t fixing rules here and there but shaking out the entire system and putting the pieces back together. It is creating an entirely new kind of grid market, one where small decentralized energy projects transact. This distributed grid will keep the lights on in parallel with the larger wholesale (big power plant) grid. Getting it right will take years. But a working group recently offered an interesting view of how the New York model might work, especially in the early years. This came in the form of a draft report on market design and platform. It was put together by about 40 experts as part of the state’s Reforming the Energy Vision (REV). 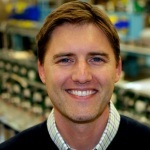 The core team includes staff from the Department of Public Service, the New York State Smart Grid Consortium and the Rocky Mountain Institute. For those new to New York’s decentralized energy movement, here’s a quick primer on how REV works. 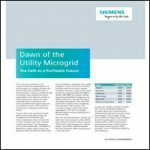 Electric utilities take on a new role; they combine forces to create a kind of local farmer’s market of energy, a transaction platform where electricity customers, aggregators, energy service companies, microgrids and distributed generators exchange goods. They also act as a bridge between the distributed and wholesale markets. None of this will happen overnight. The report envisions a staged approach to minimize risk. Along the way, the new system will be tested and refined, with a watchful eye on rapid technology changes. 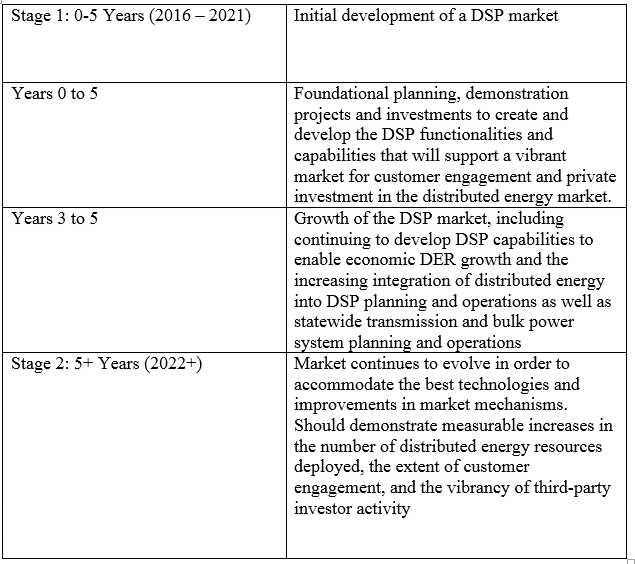 Over the first five years, distributed energy resources function within a centrally planned market. The DSP would secure distributed energy resources to meet system needs and to avoid building new wires, substations or power plants. The utilities would create an integrated resource plan that figures out how much and what kind of energy the system needs. They would then go out to bid for it. Along the way the DSP would bring standardization and uniformity to processes to avoid customer confusion. The DSP also will gradually invest in technology to create a fully functioning platform to buy and sell output from distributed energy resources. Eventually, the utility or DSP becomes less of a central planning entity and more of a manager of market transactions. Since many customers probably won’t understand the benefits of acting as ‘prosumers’ — both consumers and producers of energy — the state would create incentives to encourage them. The draft is just that — a final report is due out August 17. The ideas it proposes would require approval from the state Public Service Commission. The full Draft Report of the Market Design and Platform Technology Working Groups is available here. 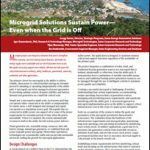 Read more about the electric grid revolution in California and New York by subscribing to our free Microgrid Knowledge newsletter.